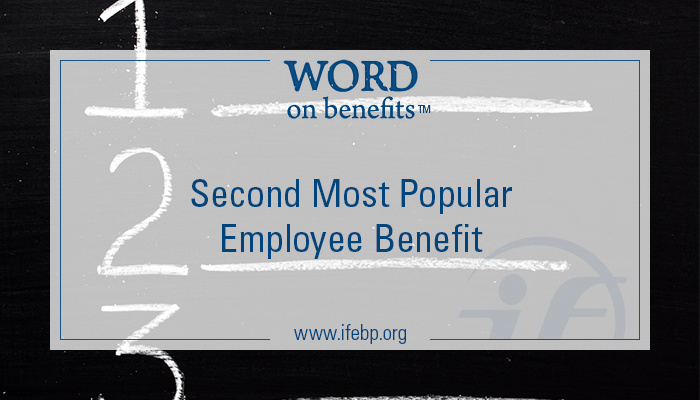 In the 2014 Employee Benefits Survey, respondents were asked about the most appreciated benefit offerings at their organization. Behind health care benefits, respondents stated that their employees most appreciated their retirement benefit offerings. These most commonly include defined benefit, and defined contribution plan options, matching features, and retirement planning offerings. Questions from the survey delved further into these topics—Here’s an overview of the findings. Over three in five (61%) survey respondents offer a defined benefit pension plan to their workers. This figure varies widely by employment sector. 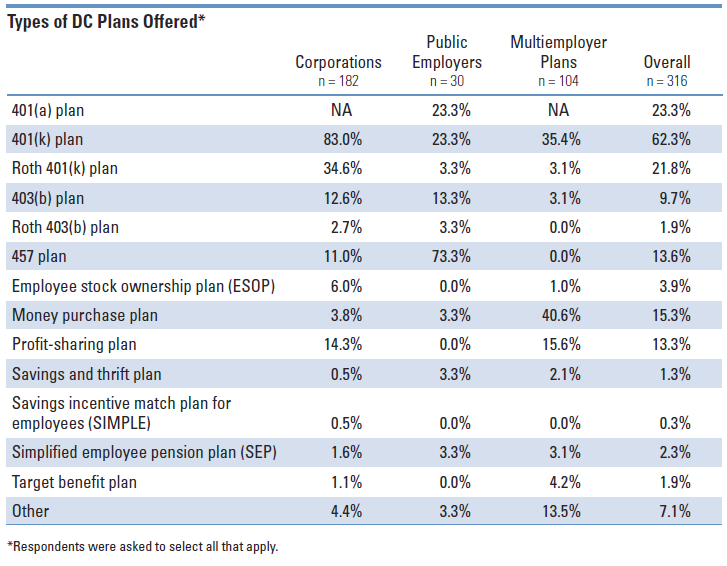 Multiemployer plan respondents (93.5%) and public employers (90.2%) are far more likely to offer a DB plan than those in the corporate sector (32.4%). Respondents offer a wide variety of defined benefit plan types. Overall, respondents most prominently offer final average earnings pensions, most commonly by public employers and corporations, but rarely in multiemployer environments. These plans calculate a worker’s pension benefit by using their average pay for a specified period of time immediately preceding retirement. Respondents also frequently offer a dollar amount formula plan. 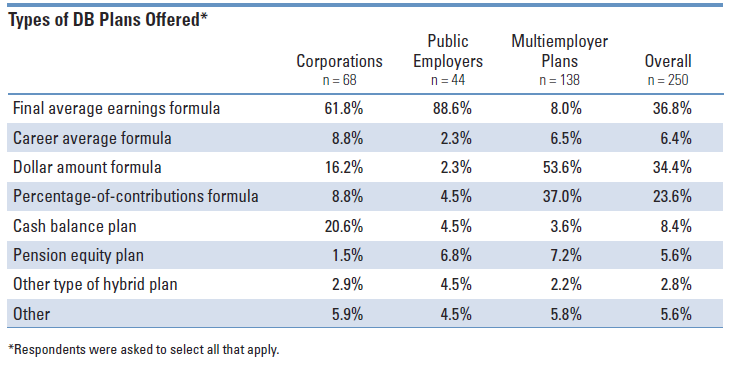 Dollar amount formula plans are offered by more than one-half of multiemployer plans, but are less common in common in corporate and public employer settings. 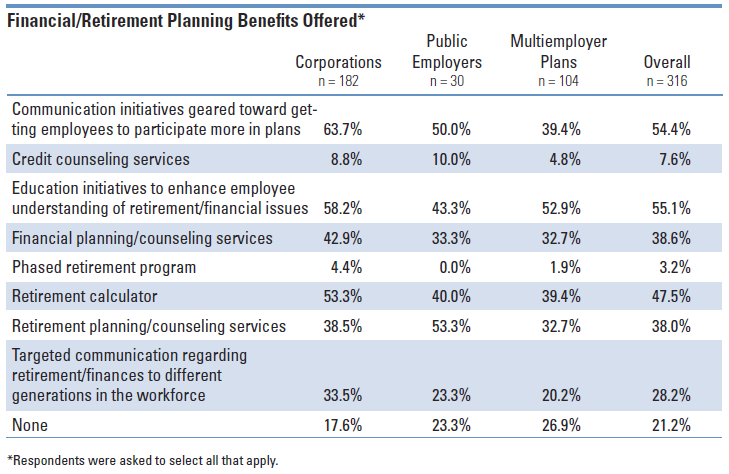 Multiemployer plans are also likely to offer a percentage-of-contributions formula pension, a practice less common by corporations, and public employers. Plans are operating at varying levels of activity. Over one in six respondents (17.7%) has one or more frozen DB plans, while 3.8% of respondents have one or more terminated DB plans. Over two in three survey respondents offer a defined contribution plan (68.4%). The prevalence of defined contribution offerings tends to be steadier across employment sectors. Respondents offer a wide variety of defined contribution plan types. These include standard and Roth 401(k) plan offerings, money purchase plans, 457 plans, and profit-sharing plans. Participant directed investments are extremely common across all employment sectors, particularly public employers and corporate plans. As an added benefit, employers commonly offer matching contributions to defined contribution accounts. Over two in five offer a fixed matching contribution to worker contributions. The most commonly cited matching formula was $0.50 per dollar for the first 6% of contributed salary. Organizations offer numerous automatic features in their DC plans. 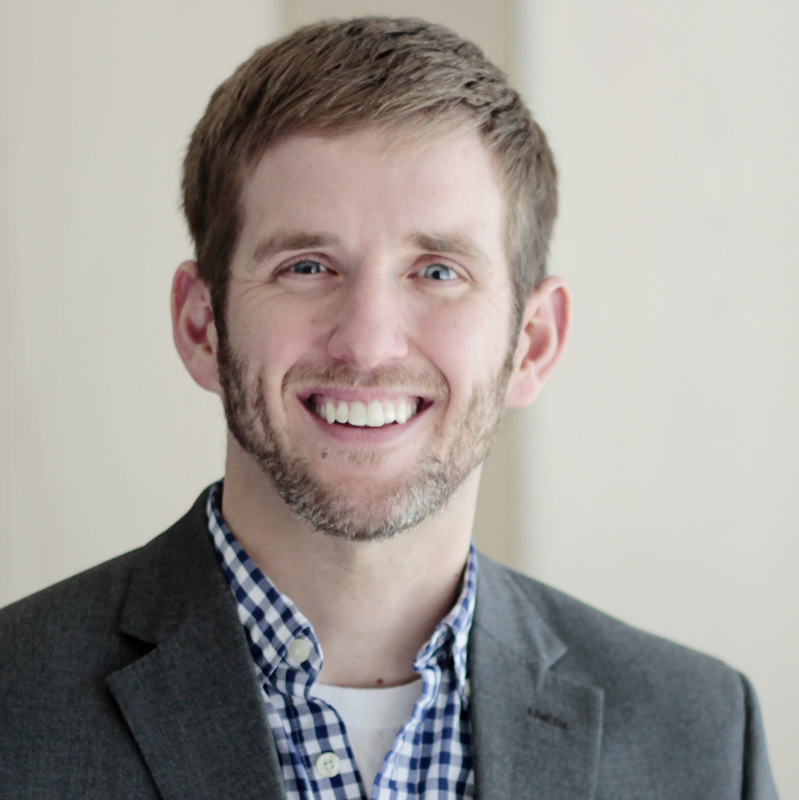 About five in nine respondents offer target-date funds, which automatically adjust asset allocation figures based on a predetermined retirement date. Less than one half of survey respondents offer automatic plan enrollment. Managed accounts and automatic portfolio rebalancing are also common. Five in nine responding organizations offer education initiatives to enhance the employee understanding of retirement and financial issues. In addition, more than half of respondents offer communication initiatives designed to encourage employees to participate more in their plans. Respondents also commonly offer retirement calculators for participants, financial planning and counseling services, and retirement planning and counseling services. Less commonly, organizations are offered targeted communication regarding retirement and finances to different generations in their workforce.